Hopes, dreams, wishes and much more are a part of pregnancy, but along with this come doubts, queries, concerns, misconceptions and much more. Support is one of the most cherished feelings for an expectant parent. 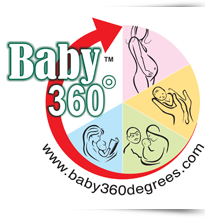 The Baby360degrees pregnancy programs have been designed to be a one stop shop for all such concerns and worries. The birth preparation sessions help to make parents understand the normal physiology of birth. They learn tips and tricks to handle labor, cope with the pain, learn pain management tips, practice breathing exercises, understand hospital procedures, enhance the role of the father in the birth process and much more. Reducing the anxiety around birth is really the best labor management trick that the website aims to teach. Making sure that your child excels not academically but emotionally, socially and also as a good human being is what good parenting is all about. From dealing with temper tantrums to toilet training, inculcating good habits to healthy eating habits, spending quality time with your little one to learning activities and skills for optimum Brain Stimulation in the Early Years, Baby360degrees is the modern age parents one stop guide. Nutrition is the the most essential part of our life and it is important at every phase. At Baby360degrees you can avail of customized nutrition plans for Pregnancy, Lactation and Weight Loss. Plans are also provided for Weaning as you introduce your little one to new foods. This is to ensure that tastes are developed and there is reduced incidence of allergies. If you have an older child and would like to ensure healthy eating habits then we have customized plans for older children as well. Once you are a registered user, you can send in your queries via email and our team of Experts will answer each query promptly and personally.